Henry Holt & Company, 9780805089615, 256pp. Evvy Hoffmeister is thirteen years old when her family brings her to Loon Lake Sanatorium to get cured of tuberculosis (TB). Evvy is frightened by her new surroundings; the rules to abide are harsh and the nurses equally rigid. But Evvy soon falls into step with the other girls in her ward. There's Sarah, quiet but thoughtful; Pearl, who adores Hollywood glamour; and Dina, whose harshness conceals a deep strength. Together, the girls brave the difficult daily routines. Set in 1940 at a time of political unrest throughout the U.S. and Europe, this thought-provoking novel sheds light on a much-feared worldwide illness. Hundreds of thousands of people died each year of TB, and many ill children were sent away to sanatoriums to hopefully recover. This is a masterful novel both eloquent and moving that gives voice to those who fought hard to overcome the illness. Marsha Hayles is the author of several books for young children. 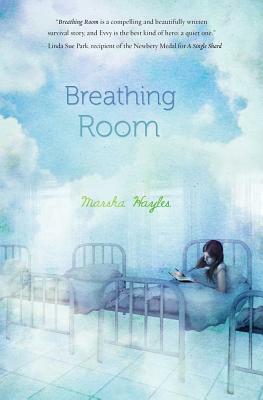 "Breathing Room" is her first novel. She lives in Pittsford, New York, with her family.